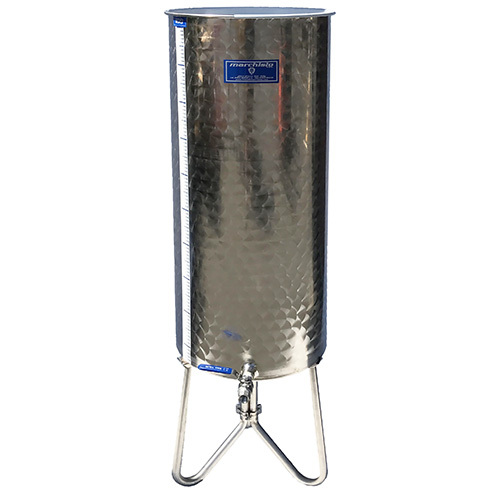 Marchisio 80 L / 21 Gallon water bladder presses offer high quality manufacturing and modern features that ratchet presses can't match. Water bladder presses are easy to use, they get better juice extraction than ratchet style presses, and are more gentle on the fruit. 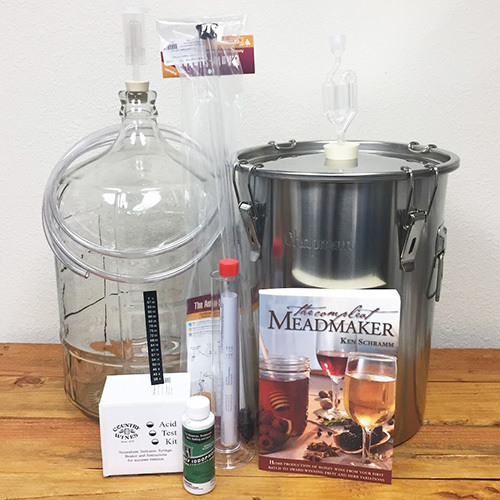 Dry ice may be placed within the press shroud to minimize O2 contact while pressing, aiding in color preservation in both red and white wines. 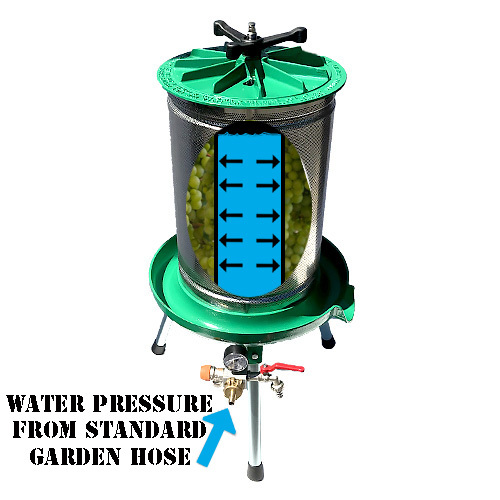 Water bladder presses are ideal for pressing grapes, and were originally designed for pressing apple pulp with optimal extraction. They have also been used for herbal tinctures, de-watering marinated vegetables, pressing honeycomb, and many other applications. A garden hose to hose barb connection PS04 and a short piece of tubing makes attaching a garden hose simple. Presses ship with legs removed in a box. Minor assembly (attaching legs) is required before use. 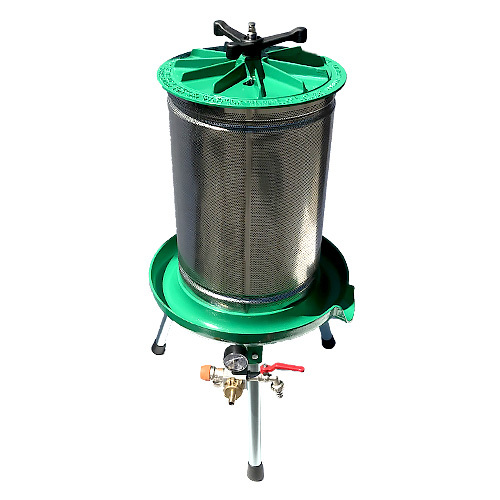 Install the included green mesh liner on the inside of the press. The mesh helps to ensure the holes of the basket don't clog as well as aiding in clean up. Place a sanitized receiving vessel under the drain spout to catch any free run. Fill mesh bag with grapes, must, or apple pulp. 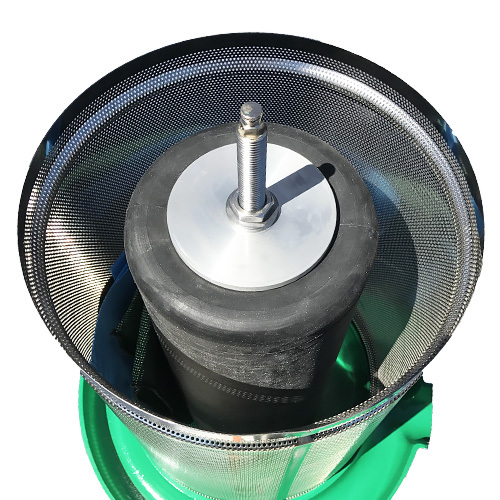 **PRESS BASKET MUST BE FULL TO AVOID DAMAGE TO BLADDER** If you do not have enough pressing material to fill the cavity, you may either partially inflate the bladder with water before filling or add pomace from a previous pressing to make up the deficiency. Re-install press lid, making sure it is secure. Cover press with plastic press shroud. Attach a hose to the water inlet. An SP04 adapter helps. Use a screwdriver to loosen the pressure relief at the top of the press. Slowly open the water flow to the press. When water comes out of the pressure relief, the bladder is full and the pressure relief should be tightened again. Pressing will now begin as the bladder expands with water. Be sure to watch the pressure gauge, keeping the pressure below 10 PSI. Excessive pressure may damage the bladder. 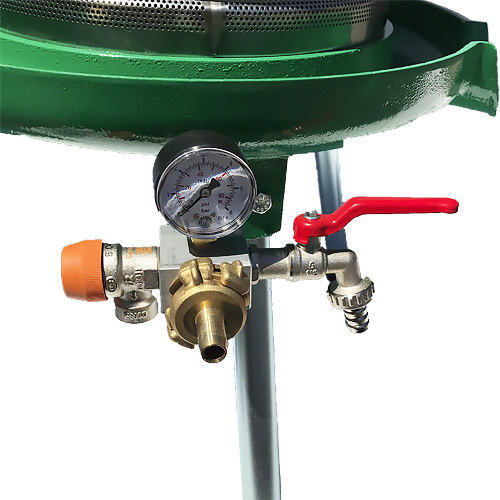 The pressure relief valve is designed to release water if the pressure is too high. If the valve is triggered, lower the pressure from your garden hose until the valve is no longer expelling water. Pressing is complete when juice no longer flows from the drain spout. The water can now be turned off and water drained from the bladder using the red lever beside the pressure gauge. Take off the plastic shroud and lid, remove pomace from the basket. If more pressing is to be done, reload the press and repeat steps 1-14. Spray down all components of the press including mesh bags. Let everything dry before storage. If you haven't done so already, open a bottle of last year's wine and take time to appreciate a job well done. Pressing will now begin as the bladder expands with water. Be sure to watch the pressure gauge, keeping the pressure below 44 PSI. Excessive pressure may damage the bladder.